Pete Miller's Water and Wildlife Studio - Real Blue Crab Jewelry - Earrings, Necklaces, Tie Tacks, Hat Pins, Brooches and Lapel Pins. Go Wild! 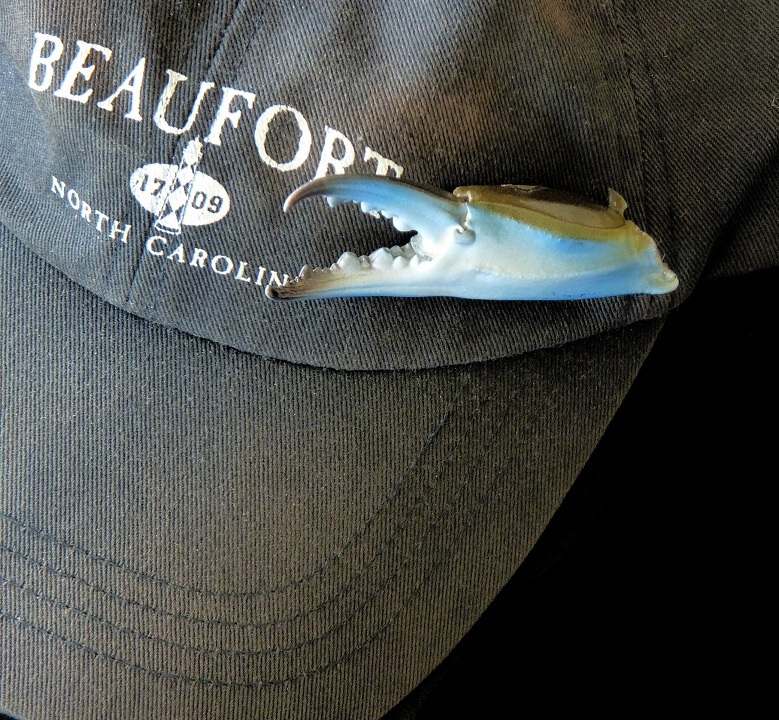 Real Blue Crab Jewelry - Earrings, Necklaces, Tie Tacks, Hat Pins, Brooches and Lapel Pins. Go Wild! Rare, cool and beautiful real blue crab claws have been completely emptied and preserved. Then each claw is expertly painted back to its natural color before being sealed with a high gloss water proof finish. There is no smell whatsoever in any of my jewelry items. Clear keepers (backing) comes with all earrings. All Jewelry Items come in white jewelry boxes with clear tops. You will be amazed how durable yet lightweight these jewelry pieces are. Great beautiful and cool beach or coastal wedding themed gifts for your bridesmaids. All jewelry pictured with sterling silver hardware. 14k gold and 14k gold plated is available. Please contact for latest prices on 14k pieces. 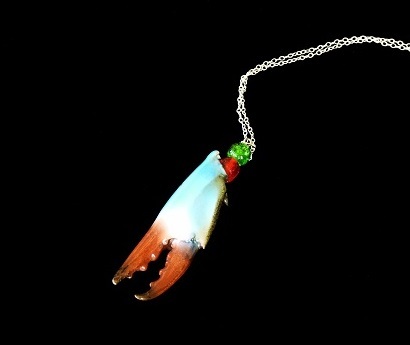 Accessory for the Crab loving Gal to wear for Mardi Gras, Crab Pickin Parties or just everyday fashion. 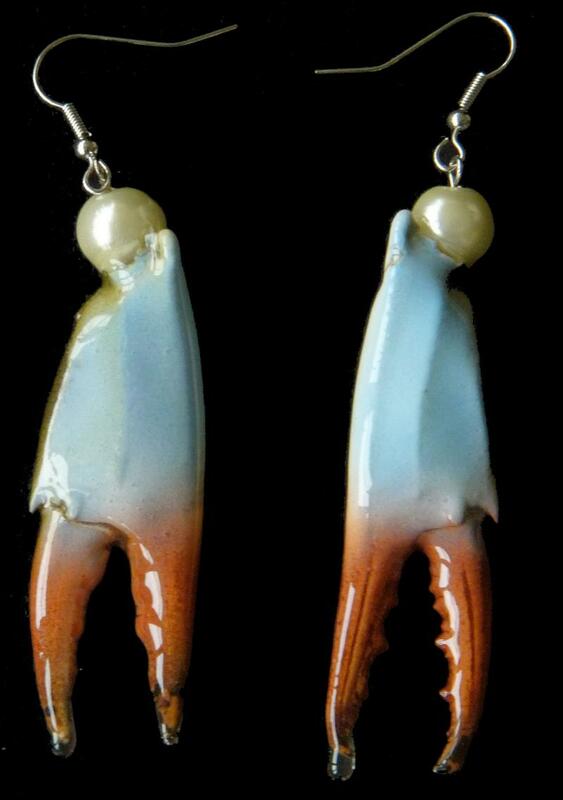 Limited Availability on the unique authentic high quality blue crab claw earrings made by hand in the USA. 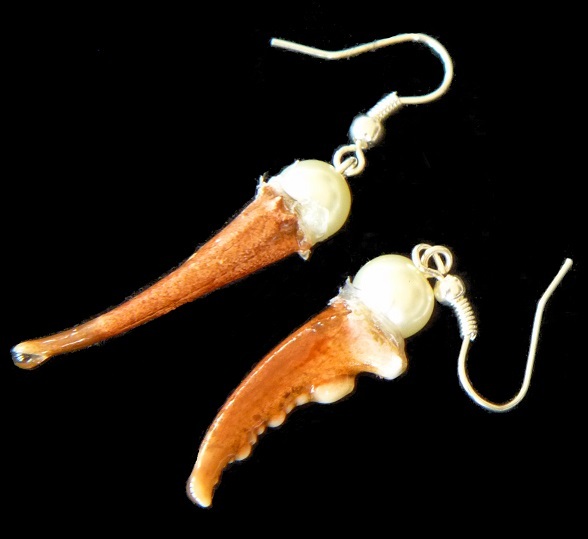 Female Crab Claw Finger earrings painted their natural red color top with great faux pearl beads. Full Claw Earrings and matching Necklace with sterling silver wires and standard length sterling silver chain. Standard length sterling silver chain and full blue crab claw at least 2 inches long. You will amazed how light weight these items are. Pictured above with matching earrings. See Picture below for port and starboard beads that are used instead of the pearl beads above. 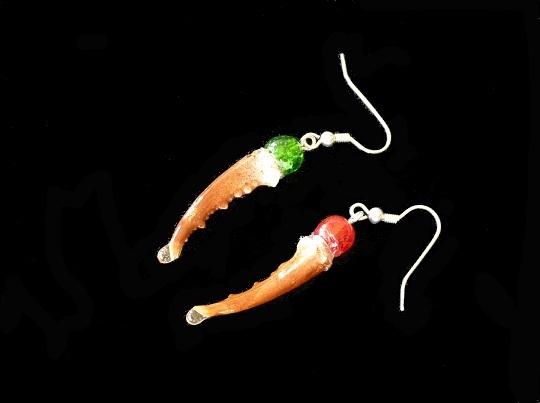 Naturally painted real blue crab finger earrings made with the top portion of the blue crab claw and adorned with green and red high quality crystalline beads with Sterling Silver wires. Crabby cool real female blue crab fingers painted their natural red color topped with crystal clear blue diamond shaped beads and sterling silver wires or french loops. All wires come with keepers. Ahoy Matey! 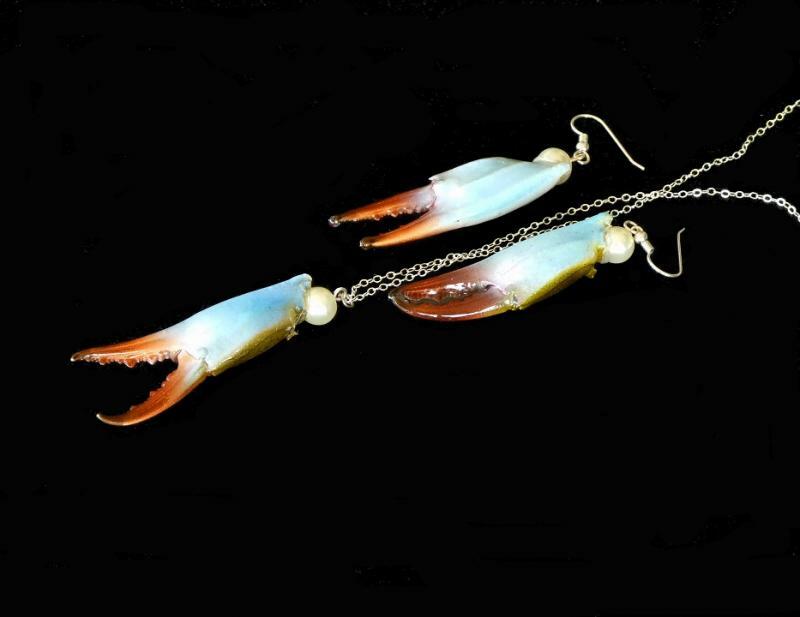 The cool crabby chic way to go nautical jewelry. Perfect for waterside social occassions and of course Mardi Gras. 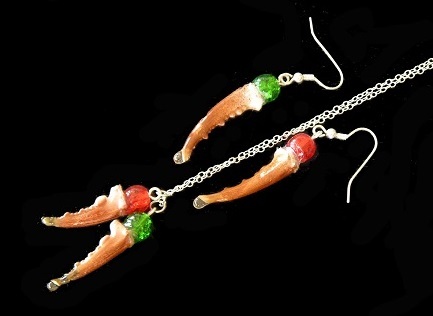 Necklace as pictured above with full claw matching earrings with one green crystalline on one earring and one red crystalline bead on the other. Great accessories for the crab parties, Zydeco dances, cajun festivals and Mardi Gras or anytime you want to be Crabby Chic. 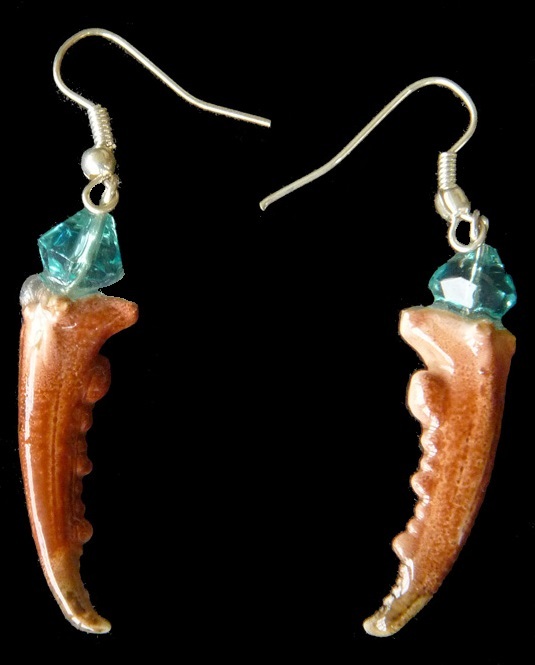 Authentic blue crab fingers earrings and matching necklace are the perfect adornment for parties at the shore, crab pickins, cajun and zydeco dances and of course Mardi Gras. Great gear for the crab loving guy. Wear as hat pin, tie tack or lapel pin. High Quality Jewelry suitable for almost any occassion. At least 2.5 inches long. Put on your cap when you go fishing, crabbing, or boating then put it on your dress clothes for all the great social occassions at the beach, coast or shore.